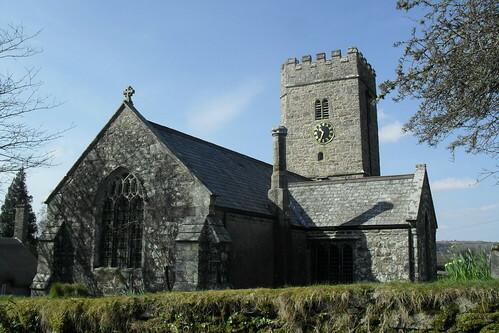 St. Peter's Church in the small village of Buckland in the Moor, Teignbridge district, Devon, England has an usual clock face, having alphabets instead of numerals. The alphabets reads "My Dear Mother". First two words start at 9 o'clock and moving clockwise read "My Dear". The last word starts at 8 o'clock and moving anti-clockwise reads "Mother". This unusual clock face was donated in 1931 by Mr. William Whiley, Lord of Buckland, as a memorial to his mother. The clock was made by John Smith and Sons of Derby. The clock is now powered by electricity. Every quarter of an hour the chimes melodically play, "All things bright and beautiful". Credits: I am thankful to willi1 - An active member of Google Earth Community Forum, for bringing this unusual clock face to my knowledge.